In the last few weeks our athletes have lined up not only at top international events, like those in Prague and Vienna, but also at smaller races in Austria for training runs. It was the first time we raced at the Oichental Half Marathon – and we got off on the right foot! In perfect weather, Wilson Meli (1:06:05) and Pauline Eapan (1:18:43) not only both won their events but also set course records. Runners ran 4 loops, and since they went by the start and finish area a total of 8 times, they were amply cheered on by the crowd. In addition to the perfectly organized half marathon, there was also a 10K, a 5K, and several kids races. A total of roughly 1,000 runners participated. Congratulations, Pauline and Wilson on your performances! Pauline Eapan used the 12K race on Saturday, 9 April as a training run, yet still only two men were able to pass her. In excellent weather, she completed the course in just over 42 minutes. Other Run2gether members also lined up to race: Anna and Robert for the 12K run, and Laura for the 4K race. Anna took 1st place in her age group with a time of 52:40. Decked out in team gear, our Run2gether squad – the pro athlete Pauline, club members and friends of various ages – turned quite a few heads. Plus, several runners from the Loipersdorf running club were pleased to see Pauline. 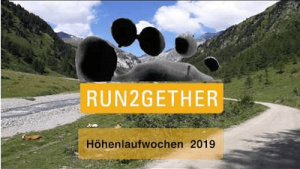 Run2gether Lauftreff Wien feiert 1. Geburtstag Großes Spielefest für 120 Patenkinder in Kiambogo!